Ċentru Antida Family Resource Centre, 51, Tarxien Road, Tarxien. Open from 7.30am to 5 pm daily in winter time (sometimes later as well). ; up to 1pm in summer Serves localities of Tarxien, Paola, Fgura and Santa Lucia. Social Work, community outreach, advocacy, referral, information, emotional support, support groups. - Volunteering opportunities, included inclusive volunteering for service users. - Volunteer Handymen in support of vulnerable and poor families. support for primary level students; For adults: non-formal learning opportunities such as self-esteem groups & literacy. - Bazaar in Tarxien (recycling and fundraising). Ċentru Enrichetta Family Resource Centre, Misraħ il-Pajtier, Birżebbuġa. Open Mondays, Tuesdays and Wednesdays from 8am to 2pm. Social Work service; Family Literacy Support Programme; MCCF service on Tuesdays from 8am to 11am. Tel No. 21652038—99960381. 2. LWIEN Service - support for family carer-givers of persons with mental health problems. 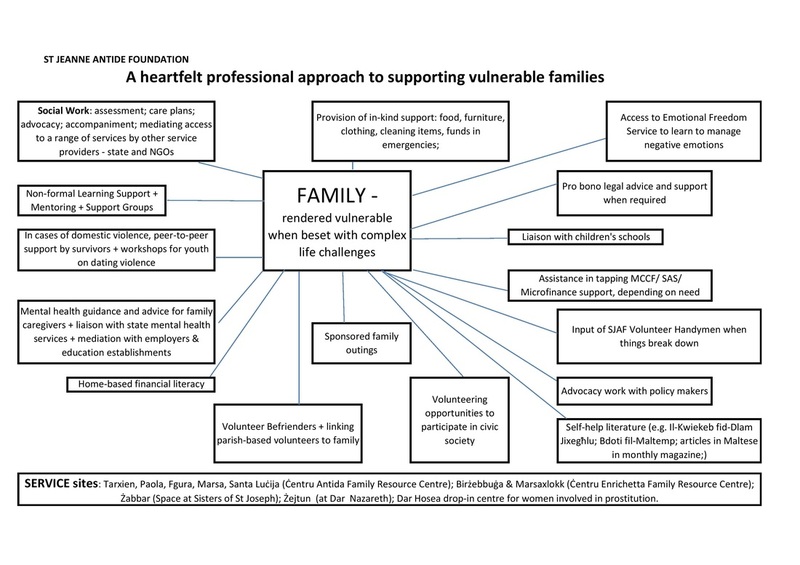 Includes family consultations, counselling, support groups, home-visits, social work. 3. SOAR Service: advocacy and support for victims and survivors of domestic violence. Includes workshops on dating and domestic violence for young persons. Tel No. 99927872 from 9:30am to 5pm. Email: soarmalta@gmail.com. 4. Esther House: meeting the needs of vulnerable young pregnant women and mothers aged 18 to 25. The service includes accommodation, an educational programme, group-based activities and support that enables the mothers to live independently. 5. Emotional Freedom Service for persons wanting to be free from their anger, fear or other emotional distress. 6. Overseas Development Projects: SJAF works with partners in developing countries to formulate anti-poverty projects. It has also arranged for public funding of such projects in Pakistan, Central African Republic, South Sudan and Malawi. 7. Centering Prayer Group for contemplative prayer practice.